RMS upgrade kit for rEvo rebreathers. 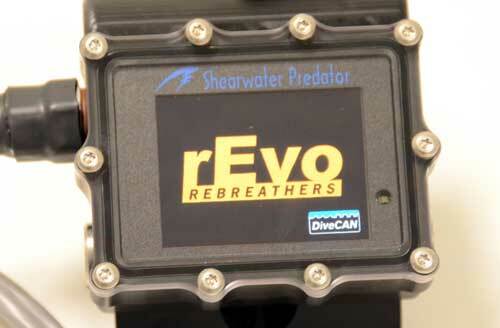 Includes all needed parts to upgrade any rEvo to a RMS unit with DiveCan electronics. 1. How is the rMS configured? rMS full starts with a Predator DiveCAN TM wrist unit (1), connected to an external battery pack (3), over a cable with a wet mate able connector (2). Unlike the classic Predator, this unit does not have any analog signal lines going in and out. It communicates over a digital bus, in this case the CAN bus. The use of digital communication guarantees that any cable problem that causes errors in the communication, is immediately detected. (This is unlike analog signal lines, where you just get a lower or higher signal). The Predator DiveCANTM unit is connected with an electronics board in the external battery package (3). This package contains a 9V battery that is used to fire the solenoid, and to give main power to the scrubber electronic systems. The electronics board in the battery pack takes care of power distribution between all systems, and is connected with an electronics board in both the exhale lung (5) and the inhale lung (8), over a digital line. (All electronics boards are completely potted and can be completely immersed without any damage). The electronics board in the exhale lung takes care of the solenoid firing using the 9V battery power. At the same time, the board communicates wirelessly with the electronics inside the central axis of the exhale scrubber( 6). These electronics are also completely potted and contain no battery. The board in the exhale lung takes care of both wireless power transmission to the 'temperature sensing board' inside the scrubber and data communication (read-out of the different fast response temperature sensors). When requested, it will send the temperature info to the Predator Di veCANTM unit. The electronics board in the inhale lung (8) takes care of the read-out of the oxygen sensors in the inhale lung. At the same time, in the same way as in the exhale lung, the board communicates wirelessly with the temperature sensing electronics in the inhale scrubber (9). Both electronics boards in the lungs are also connected to the external battery pack with a wet mate able connector (4) and (7) so that, if needed, easy exchange of parts can be done. 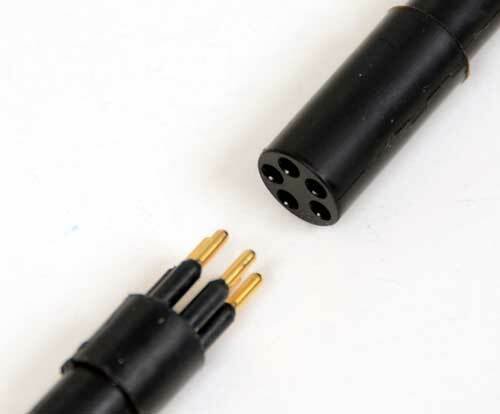 Wet mate able connectors are very robust and nearly indestructible. They easily withstand pressures over 100 bars! In summary, the Predator DiveCANTM unit takes care of displaying the PP02, executing the decompression calculation, and communicating with all the other electronics in the system. At the same time, it will run the scrubber prediction algorithm using the information from the different temperature sensors in both scrubbers. 2. How does rMS predict remaining scrubber time? The rMS algorithm to calculate remaining scrubber time is a 'prediction', similar to the TTS, or time to surface prediction. When calculating a prediction, the system makes assumptions of what will happen in the near future; between the time now, and a certain time in the future. To predict a TTS, the system assumes that you will do certain things in the near future. The system assumes that you will ascend at a certain speed, that you will make stops at certain depths, that you will (or will not) change gasses during the ascent, or keep a certain PP02. If you do exactly what is assumed, the prediction will match closely to what happens in reality. If not, the predicted time will be longer or shorter, depending on what is done differently than the assumptions made before. Prediction of the remaining scrubber time is similar. It is based on the assumption of certain oxygen consumption and associated C02 production, at a specific depth, and is related to the water temperature. Because prediction of remaining scrubber time is more critical than prediction of TTS, the assumptions to calculate the predictions are set conservatively. For example, the system will assume that the diver will have a relatively high C02 production all the time; higher than what an average diver would normally produce. Also, the time of breakthrough of the scrubber is set conservatively, even far lower than the values in the CE standard. This also means that for most divers, the remaining scrubber time will decrease less than one minute, per minute of dive time ... and it must be that way! 3. Can I upgrade my current Shearwater to rMS? Unfortunately this is not possible. rMS contains so many technological innovations that the current Shearwater units, with analog data exchange, cannot be upgraded to complete digital communication systems. To accommodate those clients who want to keep their current analog Shearwater hybrid system, we have developed the rMS light that can be added to all existing units. rMS light works similar to a back-up computer, except that it can also read oxygen sensors, and give a prediction of optimized cycling times. 4. How is the rMS light configured? The configuration of the rMS light is a 'down- graded' version of the Full. It only contains the Predator DiveCANTM wrist unit (1), that is directly connected to the electronics board in the inhale lung (8), over the digital CAN-bus, using the same type of wet mate able connector. This means that the light system does not have a battery pack, or electronics in the exhale lung, and so it cannot fire a solenoid, nor can it read temperature data from the exhale scrubber. This is, however, a typical configuration for a mCCR rEvo, or for upgrading an analog hCCR rEvo system so that there is also basic scrubber prediction. 5. Why can the rMS light only give prediction for cycling and not for full scrubber use? The most critical prediction of remaining scrubber time (RST) is always at the end, when the scrubber is close to being completely saturated. At that moment it is critical to have information on the behavior of the complete scrubber. As the light system can only read information from the inhale scrubber, it does not have all the information, so the algorithm must estimate the best possible values of the exhale scrubber. Until the time comes that the user should cycle, (exchanging one scrubber and rotating the positions), this is not a problem, as the scrubber has not yet arrived into the critical 'zone' where possible breakthrough could occur. It is, however, not safe to continue until full scrubber refresh should be done, because that moment is more difficult to predict due to the missing information. Using the light system, the user should always cycle before the RCT (remaining cycle time) has reached zero. In practice however, this time is usually much longer then the recommended cycling times without the information from the rMS. 6. Why does temperature based scrubber life prediction work better on a dual scrubber system then on a single scrubber system? As explained before, the most critical phase in scrubber use is when the scrubber comes close to saturation, so that with a sudden small increase in C02 production, the diver could get breakthrough. That is the reason why you have to add extra safety margins when trying to use the scrubber until you have to dump it completely. At that moment, however, you will still have a large percentage of your absorbent that is still unused, and the colder the water, the larger that amount of non-saturated absorbent. In a dual scrubber system however, with accurate fast response temperature based prediction, you can safely extend the time until you have to do a cycle (replacing only one canister; the one that is almost saturated 100%) to almost the same time that you would have if you had to completely exchange a scrubber of the same volume in a single canister system! As in both cases, single or dual canister systems, you change when you still have a large amount of unused absorbent in your system. (Depending on the water temperature, the time to cycle using rMS will be 80 to 90% of the time to exchange the complete scrubber system) N ow, why can you safely extend the time until you have to do a cycle, to more than 66% of the total scrubber time? (As recommended when doing cycling without rMS; cold water cycling every 2 hours or dumping the both scrubber every 3 hours, warm water 3 hours or dumping the both scrubber every 4.5 hours). The reason is clear. When using rMS, it matters much less if the second scrubber is already partially saturated because of delayed cycling. The rMS will notice that the scrubber is already partially used and will take that into account when calculating the remaining scrubber time. 7. Why does the temperature sensing probe in the canister have such a peculiar shape? To achieve correct prediction of remaining scrubber life, rMS needs both accurate and fast temperature information. Accurate, because the algorithm must recognize temperature differences of less than O.3_C in the different areas in the scrubbers. Fast, so that the algorithm allows the first prediction of remaining cycling time in less than 3 minutes after the start of the pre-breathing. Both accurate and fast are not possible with the' classic' system where the sensors are located inside a central 'rod' in the middle of the canister. This system is not fast, as the thermal mass of the central axis will decrease the temperature gradients around the sensors. This system is also not accurate enough, as there is always heat-flow between the different sensors inside the rod and from the inside to the outside of the canisters at the top and the bottom of the canister. 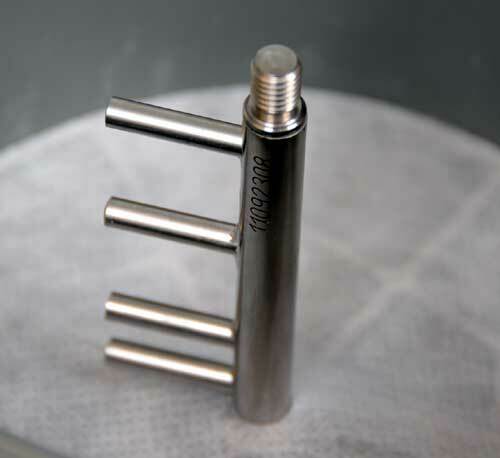 Therefore, the temperature sensors must actually be located inside and be surrounded by the absorbent to get as much as possible contact with the gas-flow through the absorbent. This sensor configuration is technically more difficult to manufacture, but is the only way to get the most correct prediction. 8. I recently bought a hCCR rEvo, what are my options? We understand that people who have recently bought a unit, just before we announced the new rMS, may have preferred the newer system. This is normal. On the other hand, the small companies in this industry rely on ongoing sales to fund research and development. If sales of current products don't continue, then development stops too. To solve this problem, we will give users who have recently bought a system the choice to upgrade their rebreather to the new system, at exactly the same cost as if they would have bought the new rMS. This offer is valid for anyone who bought a unit in the period of 3 months before the announcement on October 19, 2011. The 3 month period is calculated as the time between paying for the unit and the date of the announcement. This offer is valid for 3 months after the announcement.